A Scan of My Great Grandmothers' Scrapbook, 1918 or so. The page on the left is a recipe written on my GGrandfathers stationary from his bar! The one on the right is a home remedy. 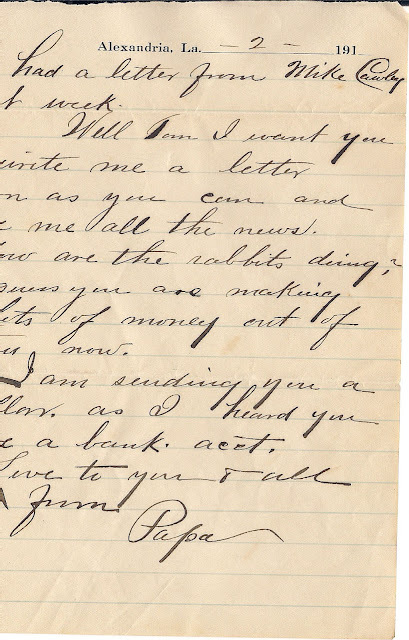 Can you imagine that's how everyone wrote back then? Over the last 20 years I've been fascinated with family past. I've been on Ancestry.com for almost that long and have made great strides in research of my ancestors on all different branches. 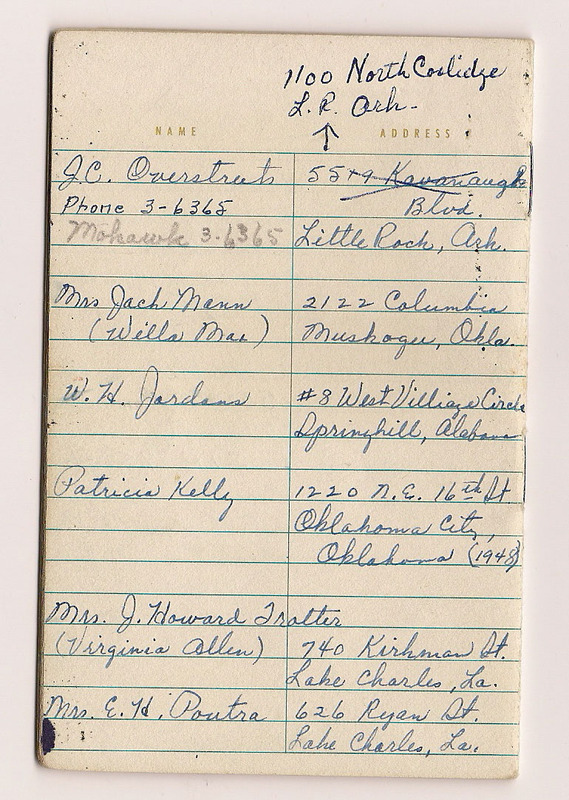 As my family got word of my obsession with family history, I became the family archivist as well. I received tons of photos and I am proud to say that just about every one I was given has been posted on Ancestry.com for all posterity! My uncle sent me a box with all kinds of cool stuff that came from my mothers' side of the family. 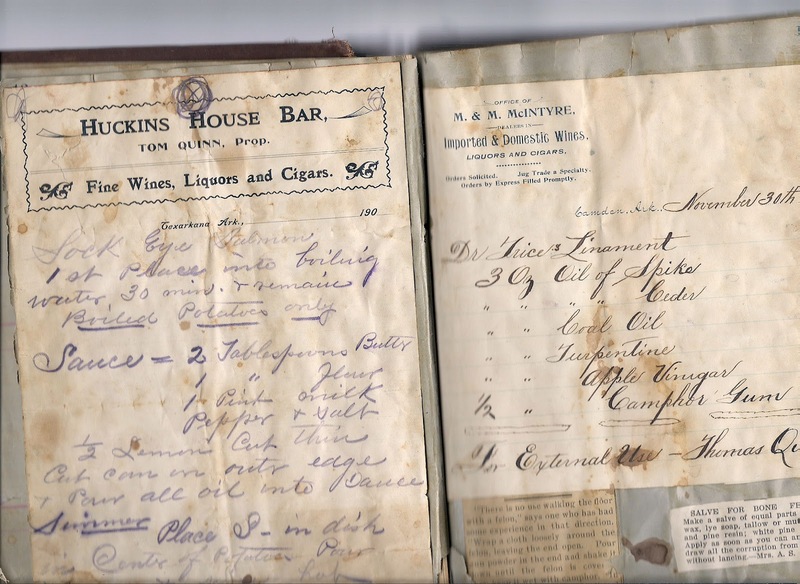 My Great Grandmothers' Scrapbook, a recipe book, an address book and more were in that box. The first time I went through the box was just a cursory look to see if there was any hidden treasure....The second look was to be a little more thorough because I had the time. The third look I realized I'd found treasure! 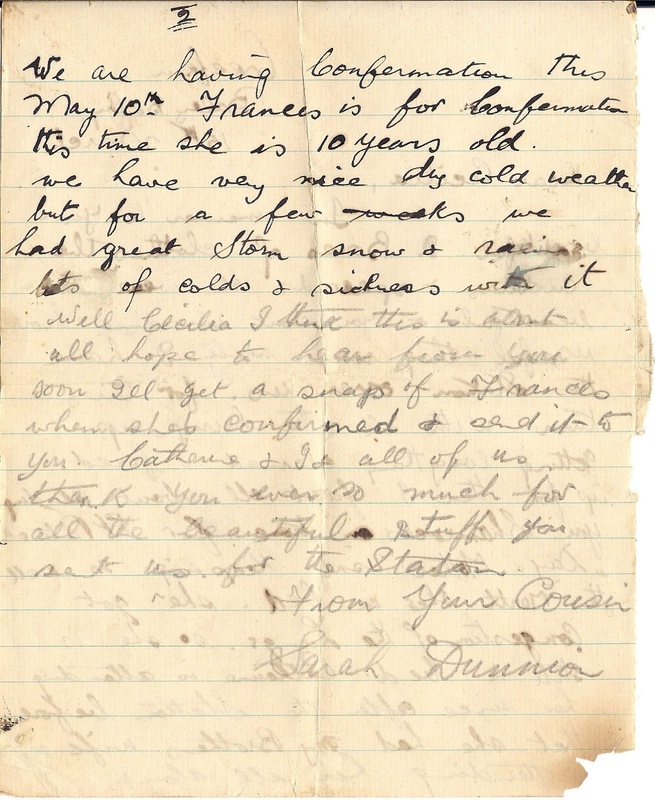 I discovered handwritten correspondence between my great grandparents and other family, recipes, and other notes. These are precious documents that I had taken for granted on the first glance. This is one of my favorite finds. Notice how beautiful my G-Grandmothers handwriting is. 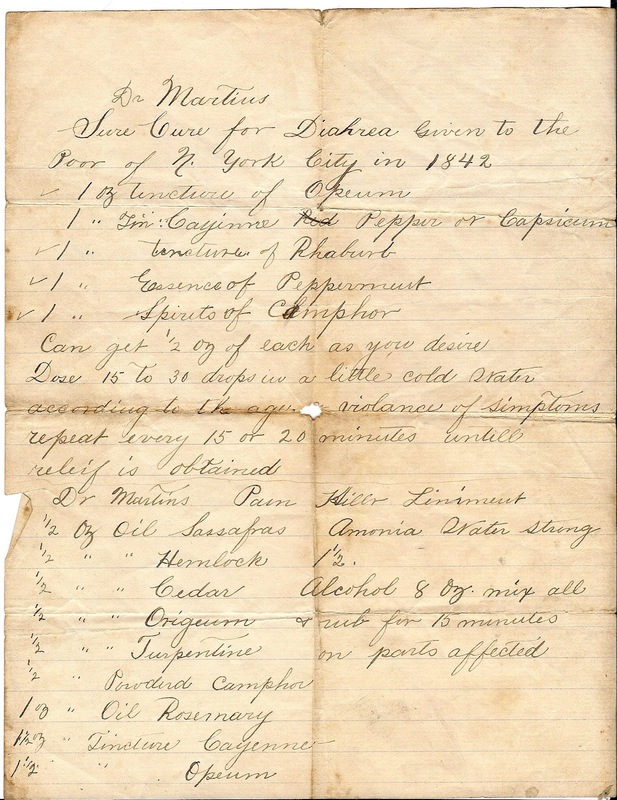 Then take a look at the ingredients in this potion! 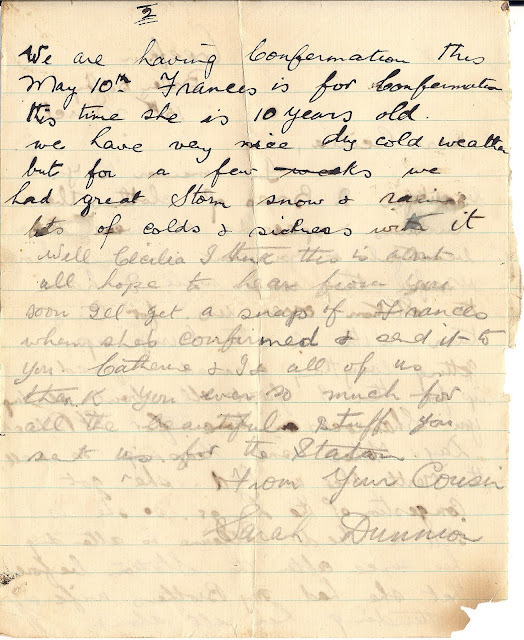 A letter my great grandfather wrote to his son, my grandfather. He later died that same year during the flu epidemic. At the last Daughters of the American Revolution meeting I attended, it was reported to the ladies that a proposition was made at the last convention, that the DAR champion and encourage the teaching of cursive handwriting in schools. I went home and started looking up what was happening to that small, unappreciated art form. 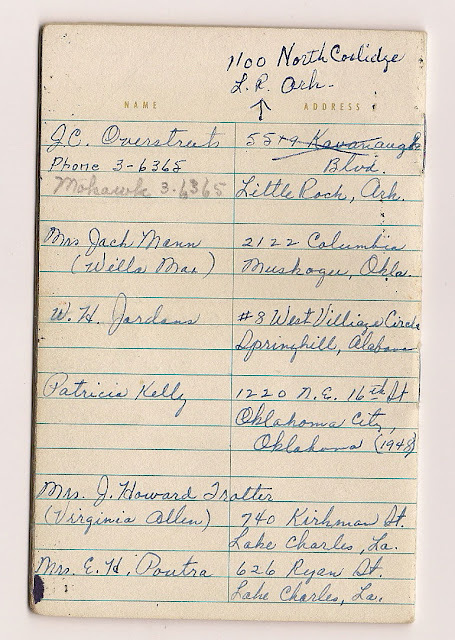 A sample from my grandmothers' address book. I always loved her handwriting and started making my "G's just like hers to sign my name. I learned that due to the age of technology, learning the keyboard is higher on the priority list than teaching cursive writing. I completely understand that we live in an age when the use of the computer grows everyday and that all children should be proficient in its use, otherwise be left in the dust. I also recognize that teachers have innumerable benchmarks and objectives to meet with their students and little in the way of time to get there. 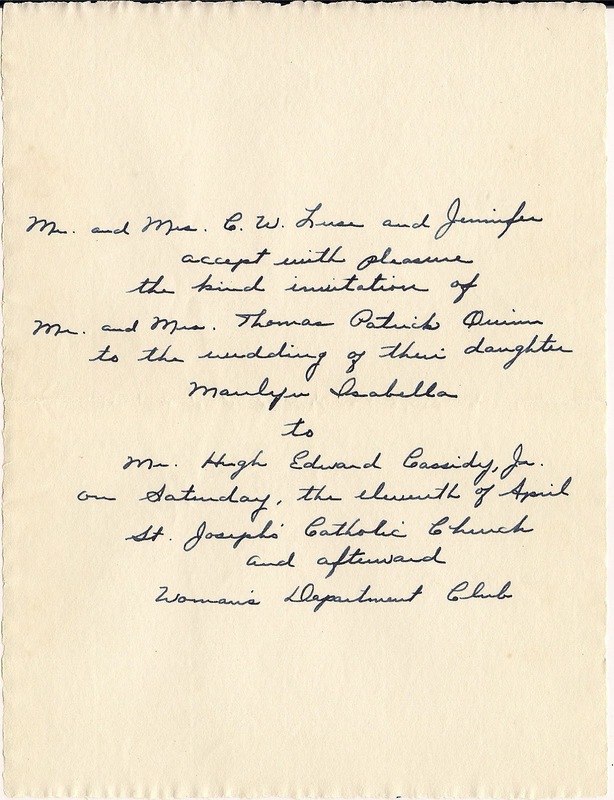 A lovely sample of handwriting by my cousin Catharine Ann accepting the invitation to my parents wedding. Matthew J. Gaiger wrote, "Because children are developing their fine motor skills, cursive writing allows them to gradually improve their eye-hand coordination versus straight lines that strain students. The first step in developing our cognitive abilities is the development of our fine motor skills. As our brains learn to connect our inner worlds to the external universe, we begin to recognize abstract ideas like awareness of others and perception. Cursive writing affords us the opportunity to naturally train these fine motor skills by taking advantage of a child’s inability to fully control their fingers. This means cursive writing acts as a building block versus as a stressor. With a less strenuous learning experience, children can progress in their learning at a faster, more efficient rate." Beth McKinney goes into a lot more detail about how cursive writing stimulates and develops the brain. I found it disturbing when she noted that, "As information replaces industry in the marketplace, parents, educators and students themselves have come to place more emphasis on the development of knowledge over the development of physical skills. Those who work with their hands are considered less valuable than those who work with their bodies in many sections of our society." As one who works with my hands I consider that a slap in the face. There needs to be a change in that type of thinking! 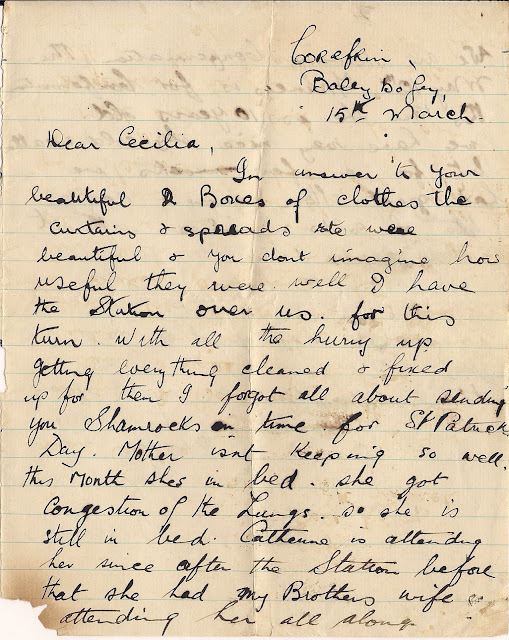 Here's a letter to my Aunt Cecilia from one of our cousins in Ireland. 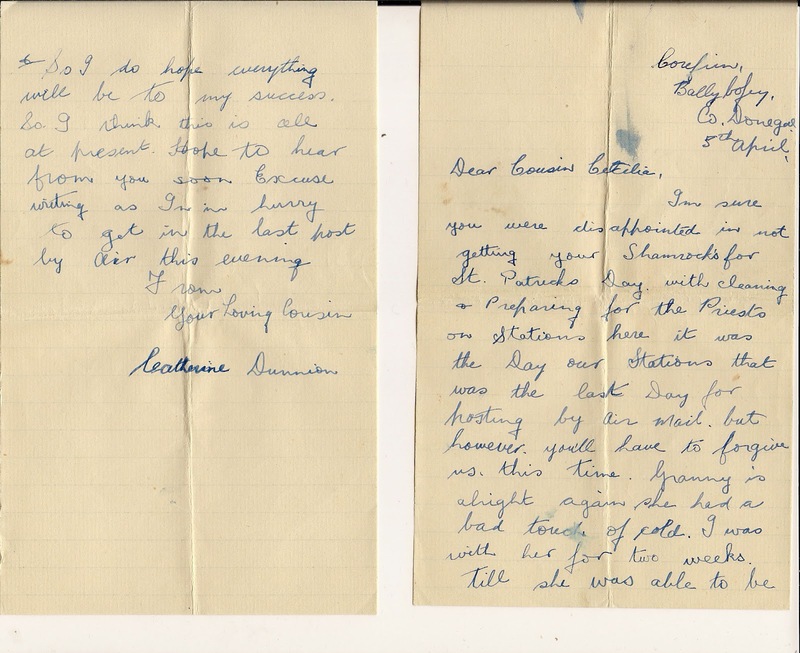 I believe they were teenage pen pals during this time. 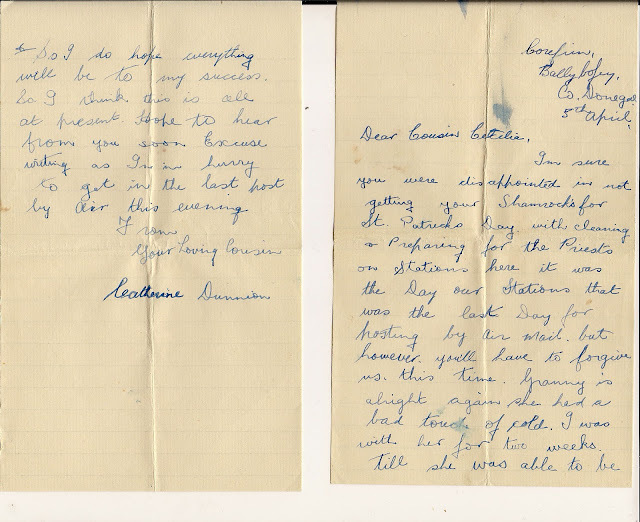 It was a long letter so I'm only showing the first and last page. As I mentioned earlier, I see cursive writing as an art form. I remember being so proud to bring home good grades in penmanship and I think I was good at it because I could also draw. I liked making my letters and eventually having a very nice handwriting. I've read many studies regarding the impact that learning to draw has on cognitive functions of the brain and I see many similarities between the findings there and those regarding cursive handwriting. I feel ashamed of myself that I've gotten away from it.....both cursive writing and drawing. Another letter from a cousin in Ireland. 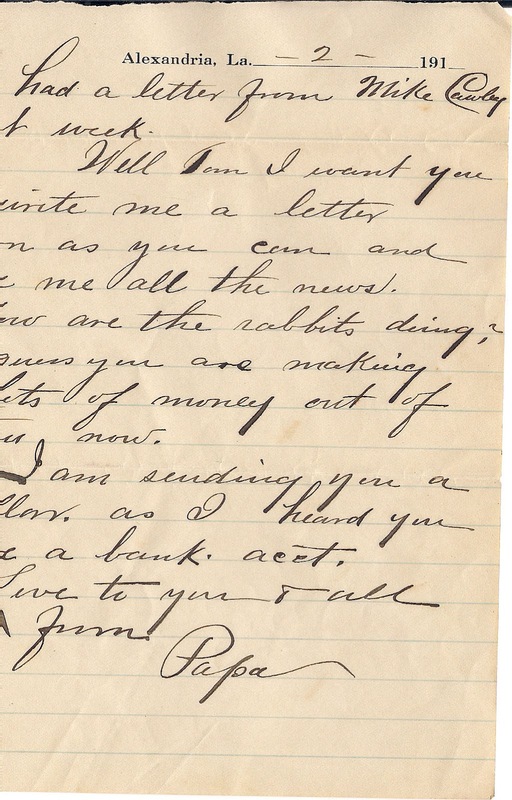 I think it's interesting to look at the different styles of handwriting as much as to read what people were interested in chatting about from one continent to the next. I think I'll pick up a pen and start practicing my letters and begin handwriting some notes from now on. 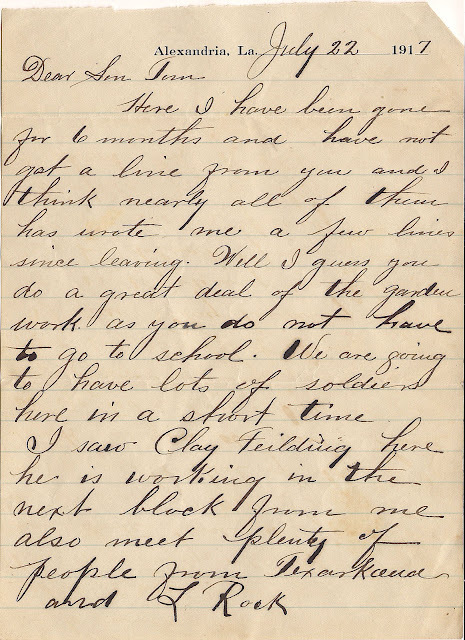 One day my descendents may find them in a box of stuff that is passed down to them and I'll be able to torture them into learning to read and write cursive, all the way from the grave! This has been quite an adventure for me! Thanks first to Lori Anderson for hosting this tremendous project. It's been a lot of fun to participate! Next I'd like to thank my partner Jane Haag. She is a very sweet and kind person that I'm so happy to have met...long distantly. I've enjoyed working with her little works of art so very much. Now, I thought I'd start out by showing a couple of teasers so you could get just a taste of what I'm serving up. Everyone should know by now that I'm not really a jewelry maker. 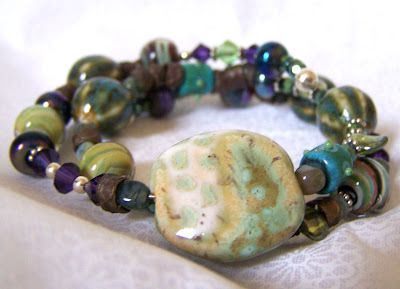 I made most of the lampwork beads in the necklace and bracelet for this Bead Soup project. I chose some of my favorites to compliment what my partner sent me. Double Helix is a silvered glass which when exposed to a reduction flame brings out all different kinds of shimmer. The main bead in the middle of the top picture is made with two different types of DH glass. The side with Psyche is where you see the green, purple and pink luster. Triton is the other side with the rich purple luster. The pinkish beads are made of Aurae, another DH glass that really is sort of unpredictable, sometimes gold, sometimes pink and sometimes a soft magenta! My partner Jane Haag, sent me the most beautiful silver hammered pieces that she made herself. I really love how Lori Anderson paired us up, with both of us being artists that create the components of jewelry. 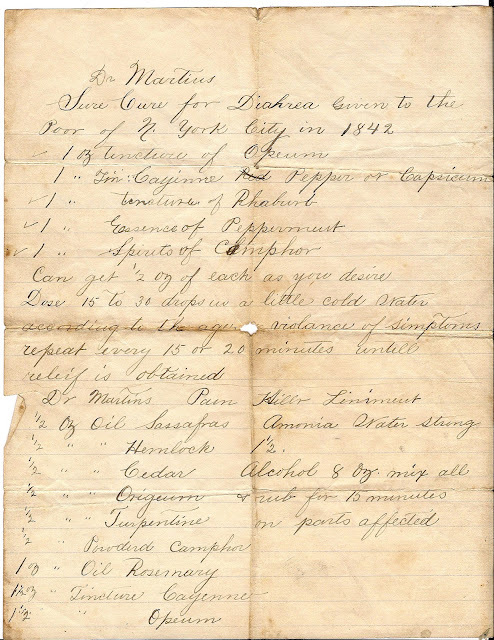 I love what Jane sent me too, and when I saw all the ingredients I pretty much knew what I wanted to do. If you read one of my blog posts a while back, you know what I mean by "Who am I making this for?" The answer is, I made it for me. I've always loved necklaces that have different tiers of strands with kind of a whimsical, random look. I also like necklaces where you see the exposed silver wire that space out the beads or charms. So that was my plan. 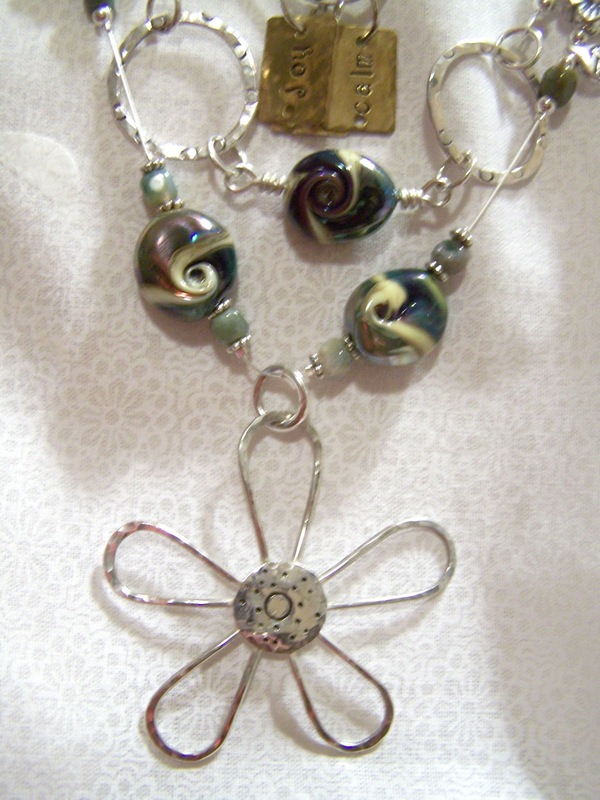 It was a no-brainer that I was going to use the sterling silver flower as the focal (she sent an alternate which I used in the bracelet). That was the main piece of the bottom tier. The silver hammered rings were stunning, but she only sent me three! The challenge there was how was I going to make this work....remember I'm no jewelry designer. I played around with different ideas and came up with the idea of wire wrapping one of my beads to link two together. So that was the focal of the next tier. Finally, on the last tier I used that last ring to attach the sweet little charms together. Joy, calm, and bliss.....well, not yet. I could write a book about the struggles I went thru putting it all together, but I know you have other blogs to hop. Let's just say that I felt that joy, calm and bliss after about 3 weeks working on it...on and off. I had to get away from it at times to collect my thoughts and think how to solve the many problems I encountered during the construction. By the time I was finished with the necklace, I was totally exhausted so I got some of that memory wire and started using up what was left of the beads that Jane sent me. This is How We Hang! Since it was necessary for me to show how the necklace would hang around someone's neck. The only person around I could use as a model was my husband, so that was out. I could have modeled it myself, but naaahh. Please excuse the less than perfect photography. It worked out fine with the necklace display piece, even though it was dirty. I covered it with a pretty piece of fabric. In order to get it to hang right, I had to wrap the back of the necklace around the front, which shows off the lovely clasp that Jane made. Sorry to have kept you so long. I did go back and do some editing....really! 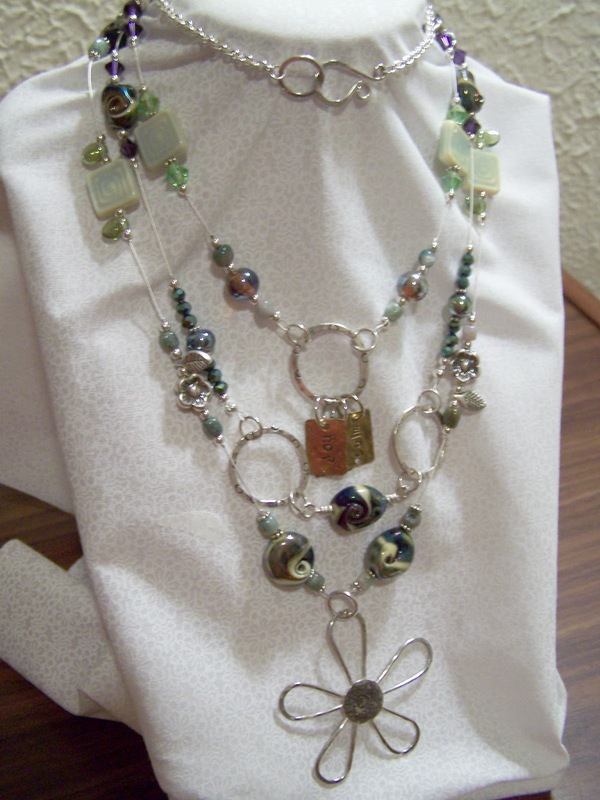 I am proud and relieved to report that I have completed my necklace design for my "Bead Soup." My reveal date isn't until August 25th, so I can't show it yet. I just wanted to say that I feel a real sense of accomplishment for having made a complicated (for me) necklace design that actually meets my own standards of craftsmanship! Most of my friends know that I am not a jewelry maker. I am a lampwork artist who is totally consumed with making glass beads from colorful molten glass. I love and appreciate beads made by my friends and heroes, I love jewelry, and I especially love jewelry made with my own beads. 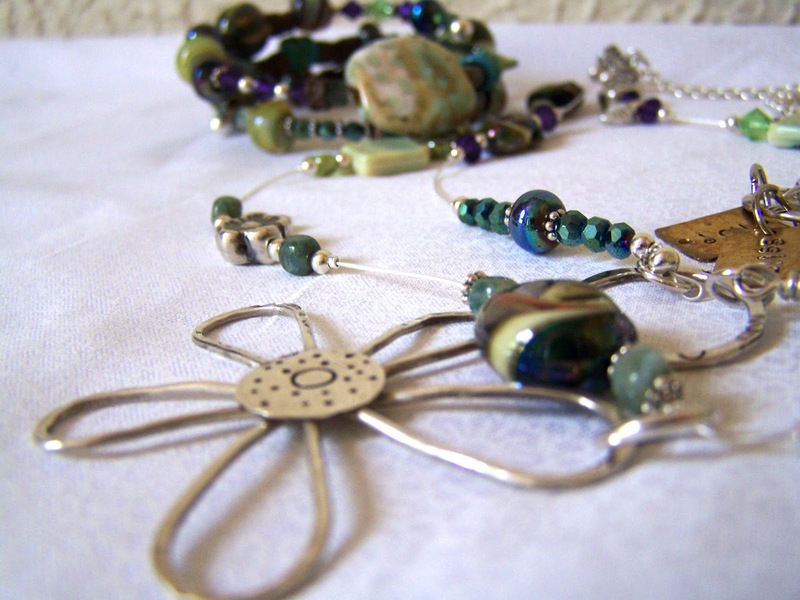 However, when it comes to creating a piece of jewelry myself, I get totally frustrated! It's so tedious, having to put the little wires through tiny holes, crimping, closing jumprings so that they don't let go, and messing up and starting over at least 20 times before I get it right. I also hate it when I ruin a piece of silver, arrrrggghhh! It's too expensive to waste! Hence the reason that I rarely make jewelry. 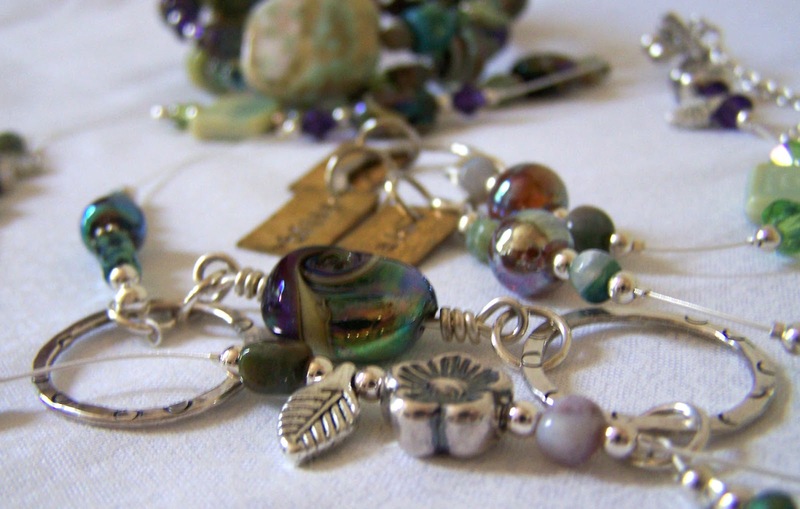 I went thru a lot of silver wire to create my Bead Soup Necklace, as well as a lot of crimps. Thank goodness there's a jewelry company that buys back silver that's been wasted. I think my craftsmanship has improved a bit too! I'm just so glad that it turned out the way I wanted it. When I tell my friends about "Bead Soup" they always ask me, what happens to the jewelry after you do it? Lori, the Bead Soup Hostess told me that you can keep it! I guess some jewelry designers sell them, maybe even trade back with their partner, but I do plan to keep mine. First of all I really like it, and second, there is no way anyone could pay the amount of money that I would have to charge given the amount of time I put into it! So I guess I'm going to have to go out and find a shirt that would set it off just right! I guess if someone offered me $200 I'd let it go,...it's worth that much to me anyway. Yesterday my husband and I went to an opening reception for local artist Nancy Brittelle. Her work is on display in Blowing Rock at Arts and Artifacts on Sunset. The announcement for the reception was in the one of our local newspapers, and the description of her work made me very curious so we went! When I entered the room where her work was displayed, it took my breath away! It was one of those moments when you see something beautiful and say to yourself, why didn't I think of that? Nancy incorporates things that all of us throw away when ever we receive something in the mail! Boxes, packing materials like Styrofoam, egg cartons, and "peanuts." 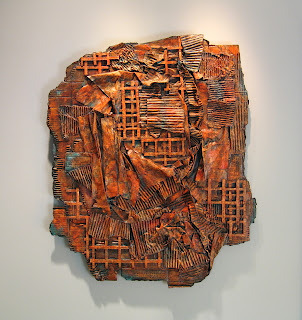 She arranges them into patterns, adheres them to a surface and then paints them with a combination of metallic paints like silver, copper, and bronze. Who would have ever thought that such materials that everyone throws away (or recycles in the usual way) could be assembled to create such beautiful pieces of art? Not me, but I wish I had! As my husband and I stood there, practically with our mouths open, Nancy approached us to thank us for coming. We didn't know her, but I feel like we made a friend. She was so warm and delightful! My husband BK used to run a gallery here in Boone many years ago and is familiar with many of the now famous local artists around here. So he told her why and how he was so impressed with her work (does that make sense?). Her response seemed genuinely delighted that he would express such interest in her. She was very open to answering our questions and was very articulate in her descriptions. Bottom line, she fascinated us! As did her work. I couldn't find pictures of my favorite pieces so I must describe the amazing imagery and intricacy of some of the pieces at the show. 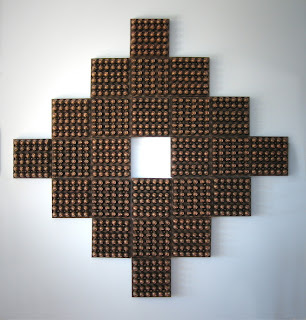 My favorite piece was a large one that hung vertically and was divided into horizontal spaces of repetitious forms. These forms were wine bottles! We used to have wine shipped to us and I thought, what a shame to throw these Styrofoam forms away....certainly we could use them for something! She created a line of patterns using the positive side of the shape, then in another line she used the negative side of the shape! 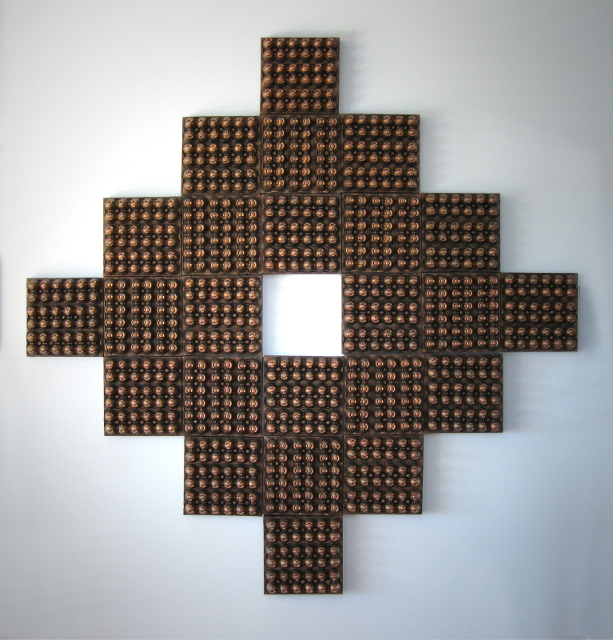 She also used other pieces of Styrofoam to repeat smaller patterns to frame and divide up the larger sections. I wish I could describe it better, but it was almost spiritual (pardon the pun!) to behold it. Another piece that held me spell bound was a smaller one with intricate spaces. It compelled me to get closer to see the details. In this piece she used strips of the very thick (but not dense) cardboard to create patterns of spaces. This was the kind of cardboard that is two horizontal sheets divided by many many lighter vertical sheets. The impression was of little secret spaces all different and all magical little doors of curiosity. I wish you could see it! Something she said about her jump, moving from realistic 2D work to 3D nonobjective work left me thinking. She was extremely well known for her drawings and paintings of old places "still standing" around the countryside of Watauga County. Her work in this genre sold extremely well and people were dying for her to do more and more. She recently went to Italy and took tons of pictures with the intention of coming home to continue in the same vein of successful, sales worthy work. However, when she started trying to churn it out, she hit a wall and just didn't feel the same energy to create it. She asked herself, "Who am I making this for?" A light bulb came on and she realized that painting for someone else wasn't what made her happy. She needed to do art for HERSELF! That's when the light bulb came on for me! 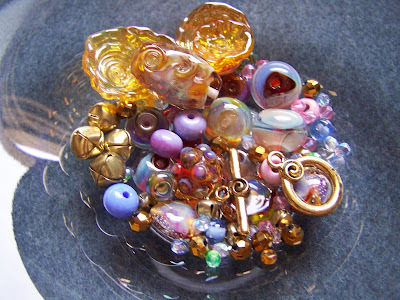 I churn out beads all the time with the pure intention of making some money. Well yeah, I gotta pay for my glass and gas somehow, but is it making me happy? More than often, I find myself veering away from "the plan," and I just play with my molten, colorful, reactive glass. It's not always about success, even fails can be fun. That's when I'm making beads for me. As artists, that's the best thing we can do for ourselves, is just create to please YOU. The more you do it, the more likely it will be that you end up doing something that pleases others in ways that exceed your own expectations. How awesome that must feel! So I leave you now to explore the links above to the story of Nancys' work on her website, and in the news paper stories about her. There you can get a feel for the warm, lovely and talented lady she is, plus see more of her work. Oh boy! Don't these look like the most yummy ingredients? I hope my photography is doing them justice. I certainly took enough different pictures! But finally, I think I captured the right composition to present Jane Haag's lovely gift in the right light. 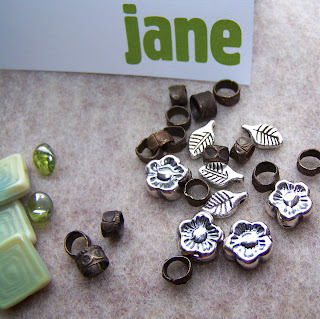 Here is a close up view of Jane's handcrafted silver pieces. This is my favorite part of the soup. To me, the best part of this challenge is to be able to hold little pieces of art that were made with the heart, soul, and sweat of another artist. 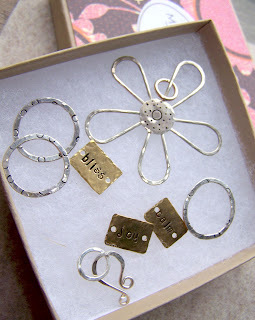 All of these pieces were stamped, soldered and forged by Jane. The flower will absolutely make the best focal, as she needlessly sent me two. I keep dreaming up different arrangements for using these pieces in a jewelry design, and I haven't decided anything for sure, but never doubt these will be the highlight of the piece! 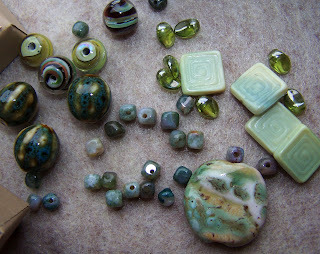 Jane sent me a nice selection of ceramic, pressed, and lampwork beads. They all coordinate with the African Kazuri Bead which is the alternate focal. I'd never heard of Kazuri beads, but since Jane sent me one as an alternate focal, I knew it must be special. When I Google'd it, I learned there's a charming story behind these "small and beautiful" works of art. She also sent me some jasper cubes to compliment the whole set. I particularly like the ceramic beads! They are so earthy, yet they have an organized stripe design on them. The pressed glass is also really lovely. I think they will make a nice bracelet combined with the Kazuri bead. I love the silver leaves and flowers she sent me. I'm fairly sure these will be used in the necklace I'm going to make with Jane's other silver pieces. She didn't mention the brass spacers as being her own handy work, but they are stamped and I think they would look neat in an earring design. I've linked three together and we'll see if that works. This is going to be such a fun adventure! I am VERY glad we have an August 25th reveal date! If that doesn't give me enough time then I'm just a louse! Jane, thank you so much for selecting such a neat collection of your stash to share with me. I hope I can do it justice. I had a time deciding what I wanted to send her. I have a lot of beads! So my strategy was to pick out one of my favorite focal beads and work around that. Seems logical? It took me long enough to figure it out. This arrangement is the only photo I have. I just poured the beads and other nick-knacks into a bowl, like soup. Therefore it is sort of hard to see the details and differences between them. The focal bead is at the top of the picture, but it doesn't contrast very well with the disc beads. I bet Jane does a better job of showing them than I have. 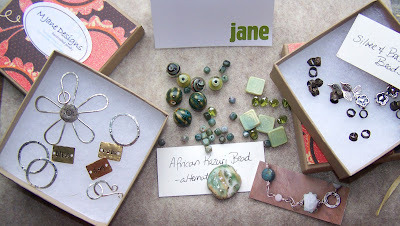 I'm still waiting to hear from my Bead Soup partner Jane Haag, of MJDesigns so that I can show you what she sent me! Also waiting for the postal service to deliver the wire and other components I'm planning to use for my Bead Soup jewelry. Got my "Bead Design Studio" magazine today, and what do you know? There's an article in their "Marketing 101" section about Blogging! You know, tips to get your work seen and sold? Anyway, it was a pleasant surprise to read that Lori Anderson is one of the main people they interviewed to talk about blogging and how to get your work seen by others! Kinda feels like I know a celebrity! There were lots of neat tips and ideas to jumpstart a blog. Lori is the perfect person to ask about that, especially since she's the one who inspired me! In your comments, please let Lori know what you've done. So I'm in it to win it! 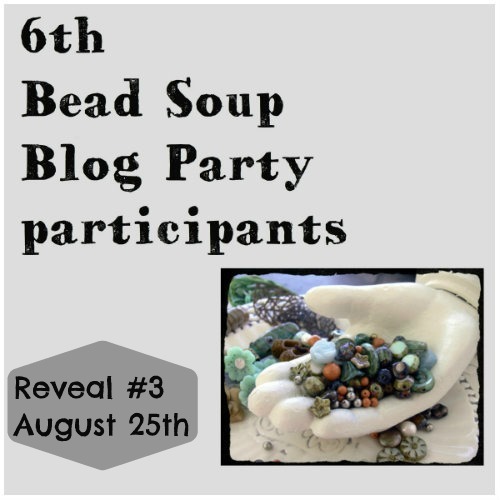 I commented that I would love to win anything she has to offer such as a selection of "bits and bobs," jewelry components that are so pretty and inspiring. 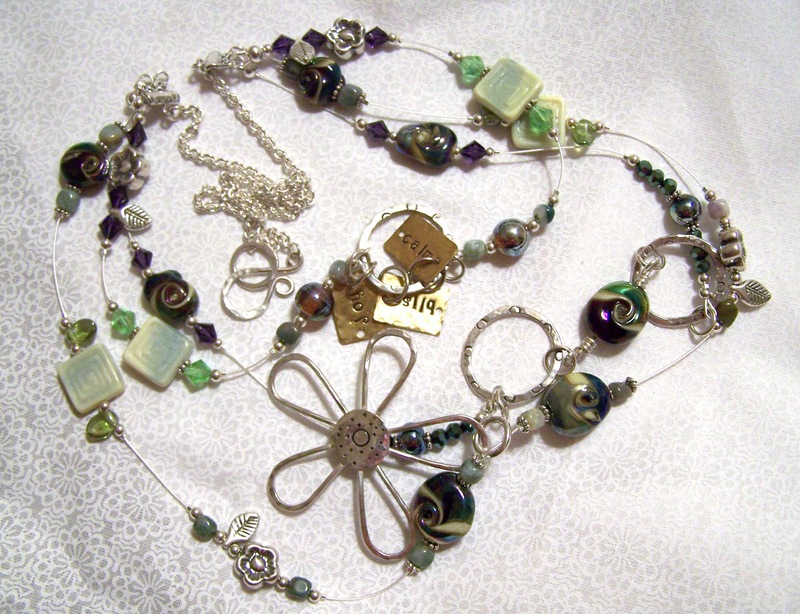 Then there's her Bead Soup Book! I would love that just to read more about how she does it. Can you imagine what she puts into a project like this? She is also offering her eBook on blogging inspirations. And a neat "I'm a Bead Souper!" tote bag! As most of us in the United States know, it's hot as blue blazes out there! North Carolina was promised a "cold front" to come thru today, but I think the dang thing has stalled. It's overcast and about 78 degrees. I shouldn't complain, it could certainly be worse! I am sympathetic to those of you suffering triple digit weather....we've hit a hundred here too for a couple or three days. But I moved out of Louisiana and up to the Blue Ridge Mountains of NC to get away from the heat! The idea of not needing an air conditioner in the summer sounded like heaven to me. So here we are in these beautiful mountains with no AC. I'm sure ole Al Gore is doing a happy dance! I may have to move in with Sarah Palin to have year round AC. I am a retired high school art teacher and I miss it very much. I have 2 precious children who are practically grown and a husband who is absolutely wonderful. Since I've retired I've focused my interests and attention on hot glass. I have been making glass beads ever since I learned the skill from an artist in residence who came to my classes back in 1995 to teach my students about everything glass. My students and I fell in love with glass beadmaking on a HotHead torch (nothing more exciting than working with students who like to play with fire!). After that I graduated on to a minor bench burner and have been producing and selling my beads ever since. I had the good fortune to attend Penland School of Crafts a couple of years ago and it was one of the most wonderful experiences I've ever had. I learned how to blow the "big" glass with a great instructor (Earl O. James) and it just fascinated me so much that I hope to do it again soon.